You land at Vancouver Airport (YVR) and want to explore Vancouver and the West of Canada on your own? Then rent your rental car directly at the airport to avoid losing valuable travel time. Compare the car rental companies at Vancouver Airport with Driveboo.com and choose the car that best suits your needs. However, as Vancouver Airport is one of the busiest airports in Canada, it is advisable to book a rental car online at an early stage, especially if you want to reserve additional accessories such as a navigation system or a child seat. Where is the pick-up point for my rental car at Vancouver airport? Although Vancouver Airport (YVR) may seem a bit large at first glance, there are friendly staff available everywhere to help you. You will find the counters of your car rental company after you have received your luggage and crossed customs in the so-called "Service Plaza" of a separate building, opposite the main entrance or main exit on level 1, directly in front of the parking lots. Which car rental companies are there at Vancouver Airport? Refuelling at Vancouver airport? Nothing could be easier! Do you have to return your rental car with a full tank? Then you can enjoy your stay right up to the last moment, because there is a Petro-Canada petrol station at the airport, which is open 24 hours a day, right in front of the multi-storey car park where you have to return your rental car. However, if you want to save a little bit of money, it is advisable to fill up at one of the petrol stations in the city centre, as they are a little cheaper. Rent a car Vancouver Airport (YVR) - rent a car directly in the city! 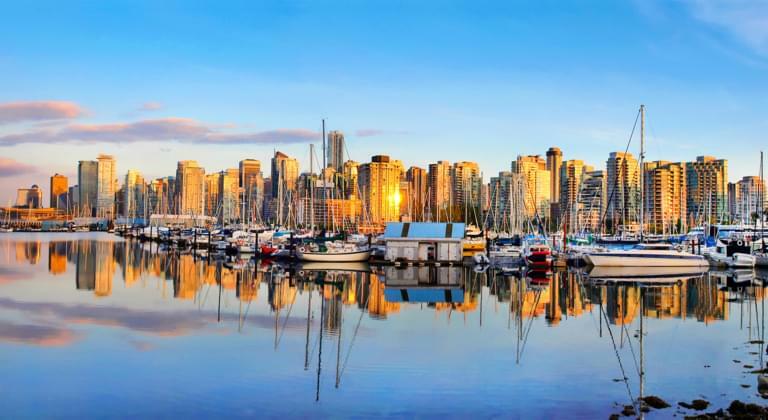 Since Vancouver Airport is located directly on the outskirts of downtown Vancouver, you usually don't need more than 20 minutes to reach each of the seaside neighborhoods, so that you can relax more or less directly in your hotel after your long-haul flight. If you want to acclimatize a little the next day, you can make some excursions to Stanley Park or the VanDusen Botanical Garden or visit the Museum of Anthropology, one of the leading museums of First Nations culture in the Pacific Northwest. But don't forget to visit Gastown, the lively district with its famous steam clock, where you will find lots of small cafés and restaurants. Below we have listed some distances that may make it easier for you to choose the right car for your project. Whether it's a taxi, train (30 minutes to Richmond) or intercity bus, at Vancouver Airport you don't have to worry about how to get to the different parts of the city, because the airport on "Sea Island" has a perfect transport connection. When returning your rental car, all you have to do is look for Highway 99 and follow either Sea Island Way or SW Marine Drive and the signs to get to the airport or vice versa. At Vancouver Airport, Canada's second largest airport, no wishes are left unfulfilled. An extensive range of fast food restaurants, restaurants, cafés and fine boutiques let the waiting time pass by quickly and if you want to enjoy a quick massage, you can visit one of the spa centers or even have a dentist do a quick refill. Car Hire at Vancouver Airport: from coast to coast, a great round trip! Nature-loving travellers in particular appreciate Vancouver as an ideal starting point for various tours or a trip from coast to coast. Would you like to see more of Canada? Then you should really take advantage of the unique opportunity to visit the surrounding area with your rental car. Just get behind the wheel of your rental car and drive from Vancouver to Banff National Park, get enchanted by the breathtaking scenery in Grasslands National Park and stop in Calgary to continue your journey via Regina and Winnipeg to Toronto. Our tip: Book a rental car with navigation system or book a portable navigation system and a second driver for your rental car, so that you can fully enjoy the unlimited freedom of Canada.